We start with an easy hike along the shore of the lake, heading West. It’s the same trail path to the place where I met the villagers who perform the worship rituals the day before. After half hour, it starts to leave the lake shore into the woods. Now it’s getting steeper. The trail path is also very dusty as it has been not raining for quite some time already in this area. I don’t know if I am to be grateful because the trail path is not too muddy and slipery, or still long for the rain because the dust is killing my throat even though I already cover my mouth with scarf..
And I’m still amazed watching those porters climb up through the trail path with all of those loads with speed and agility, only wearing sandals. It looks very easy for them, while we have to negotiate the path cautiously because the dust makes it very slippery..
That’s it! Next time I’ll wear sandals. 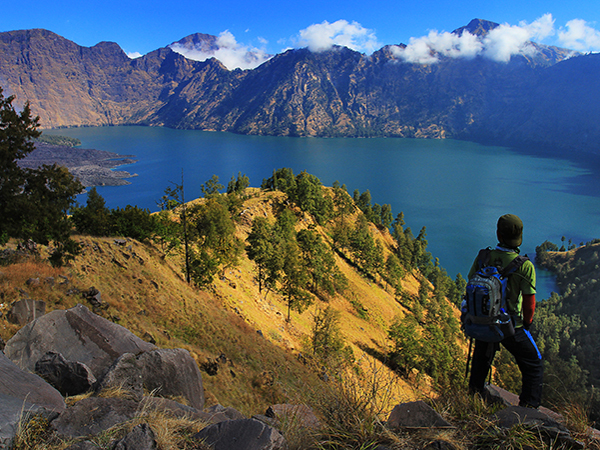 After an hour of slippery hike, we reach an open space where we can see the whole lake Segara Anak, Rinjani peak, and the whole crater rim. Altogether. So beautiful is the scenery that we spend almost 30 minutes only at this place taking photos. All other hikers also stop and spend time to enjoy the view. After a while, we reluctantly leave the place to continue the trek. It’s beautiful here, but we have to reach Plawangan Senaru before sunset, or we miss the sunset view from the rim..
It’s almost sunset when we finally arrive at Plawangan Senaru. We quickly set up our tents. The other hikers have already gathered at the spots where they think they have the best view for sunset, but Enda, Ghani and I still moving around looking for the spots. The three of us eventually spread out setting up our cameras at separated spots. We are ready for the sunset. And Plawangan Senaru doesn’t dissapoint us. It’s like living in different kingdom up here, above the clouds.. But it doesn’t stop there. 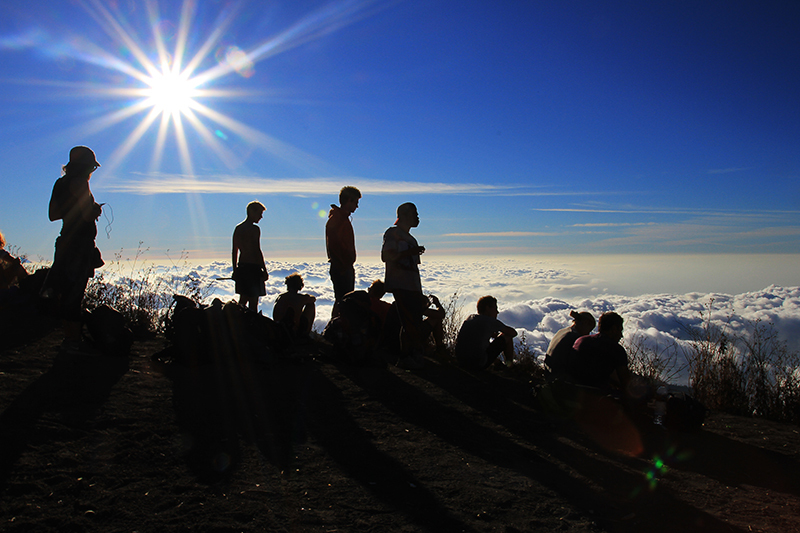 We wake up early before sunrise, and once again Senaru offers its beautiful scenery. The lines of the hills below us over the morning sun, the view of the grand Mount Agung of Bali in the distance. All of those beauties in front of us while we’re having breakfast. We can even look at West and North coast of Lombok island from this place.. Finally it’s time to pack up again. We’re going down the hill today, back to Senaru village. All stuffs are packed up, everybody is ready to go. But wait, when I check out my mobile phone, I find out that there’s signal from one of the mobile operator. So high is this place that we can catch the signal from on of the towers down the hill. It’s been few days since the last time we contacted home. So everybody takes the chance to call their loved ones for few minutes, before starting the hike down the hill along the trail path back to Senaru village. 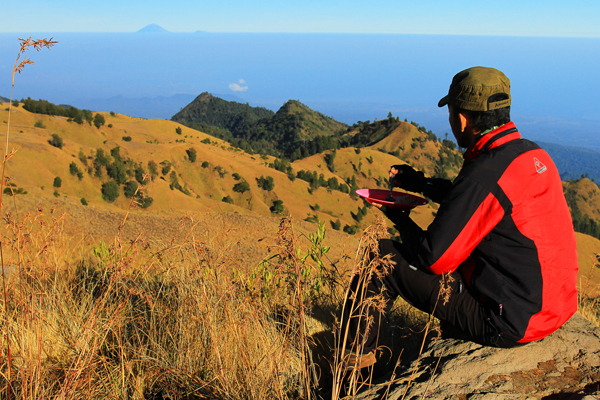 Until the next time, Rinjani..
← A Prayer At Segara Anak..